Tram 69 (or is it 68?) 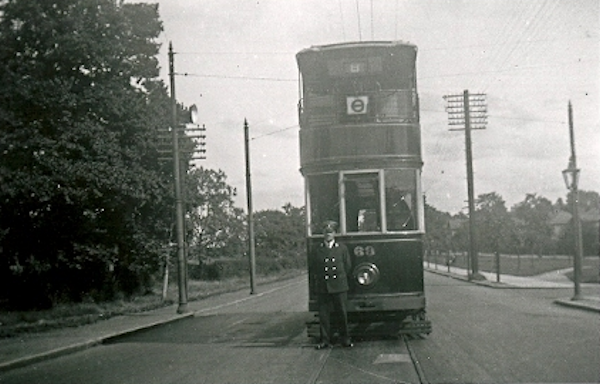 stands at the Stoke terminus, with the end of Uxbridge Avenue just visible on the right between the tram pole and the telegraph pole. Notice that there are telegraph poles on both sides of the road, one for local telephone lines and one for trunk lines to Rugby, although it is not clear which is which. The houses that can be seen through the trees on the right are probably those in Copsewood Terrace. Also notice the gas lamp behind the tram pole at the end of Stoke.